Converts to Stamina. Stuns the enemy for longer instead of knocking back. Piercing Javelin: Hurl your spear at an enemy with godlike strength, dealing [3996 / 4040 / 4084 / 4127] Magic Damage, stunning them for 1.8 seconds, and knocking them back 8 meters. Aurora Javelin: Hurl your spear at an enemy with godlike strength, dealing [4131 / 4175 / 4221 / 4267] Magic Damage, stunning them for 1.8 seconds, and knocking them back 8 meters. Deals up to 40% additional damage based on the distance the spear travels. Binding Javelin: Cost: 3442 Stamina. Hurl your spear at an enemy with godlike strength, dealing [4131 / 4176 / 4221 / 4267] Physical Damage and stunning them for [3.1 / 3.2 / 3.4 / 3.5] seconds. Piercing Javelin deals Magic Damage to an enemy and knocks them backward, stunning them for a brief moment. 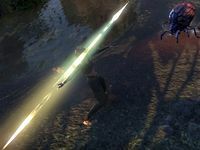 Aurora Javelin increases the damage when the ability is used at a distance, while Binding Javelin converts it to a Stamina-based image, and increases the duration of the stun caused by the attack. This spell is a good way to keep your distance from enemies, which is particularly useful when combined with a charging skill like Focused Charge, which must be used at a distance. Aurora Javelin is a recommended morph for the Templar Initiate build, while Binding Javelin is recommended for Luminous Warrior. Aurora Javelin: Fixed an issue where Aurora Javelin was adding less damage than the intended additional 40%. Binding Javelin: This ability now scales off stamina and weapon power, and now also costs stamina. Increased the range of this ability and its morphs to 28 meters from 20 meters. Increased the speed of the projectile fired by this ability and its morphs by 40%. Fixed an issue where Rank III of this morph had a 20 meter range instead of a 28 meter range. Reduced the cost of this morph by approximately 20%. Developer Comments: As all Weapon skill lines have a 20% Stamina cost reduction passive, we also included this reduction with class Stamina morphs. Binding Javelin and Biting Jabs were missed when this initially happened. Fixing this bug and giving these abilities their correct costs helps Stamina Templar with some of the sustain issues they were having. Increased the knockback range of this ability and its morphs to 8 meters from 5 meters. Developer Comments: Increasing the knockback distance of these abilities gives them a stronger niche from other crowd control abilities, and also opens up more opportunities for using that knockback with deadly results in areas with treacherous terrain (such as Battlegrounds). Binding Javelin: This morph now knocks the enemy down instead of knocking them back. Developer Comment: This change was made to help ensure Stamina melee builds are able to continue to hit their targets after activating Binding Javelin.